Now you can share Bob Staake’s unique illustrations, which have graced the cover of The New Yorker, with your children. 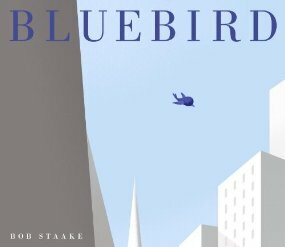 Bluebird is a beautiful, wordless mind-blowing story aimed at 4-8 year olds. In his most beautiful and moving work to date, Bob Staake explores the universal themes of loneliness, bullying, and the importance of friendship. In this emotional picture book, readers will be captivated as they follow the journey of a bluebird as he develops a friendship with a young boy and ultimately risks his life to save the boy from harm. Both simple and evocative, this timeless and profound story will resonate with readers young and old. Bob Staake has been working on this book for 10 years, and he believes it is the story he was born to write. Check it out!